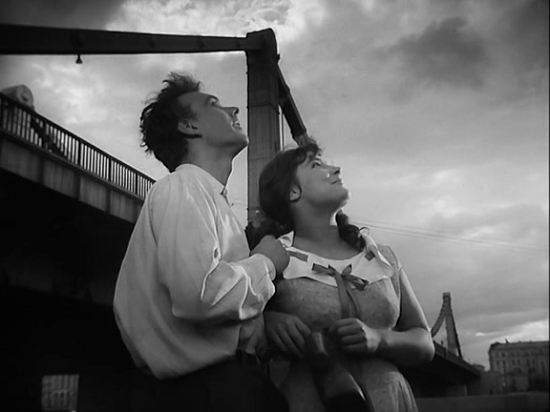 Winner of the Palm d'Or at the 1958 Cannes Film Festival, The Cranes Are Flying is a stylistically powerful example of Russian visual poetry from the Cold War era. Mikhail Kalatozov's luscious portrait of love and loss during World War II stars almond-eyed beauty Tatyana Samojlova and handsome Aleksei Batalov as moony-eyed young lovers whose innocent romance is shattered by war. Its inventive virtuoso camera work serves a story that offers us genuine emotion and resonance, punctuated with honest humor, heartbreak, and observations of several enduring forms of love. 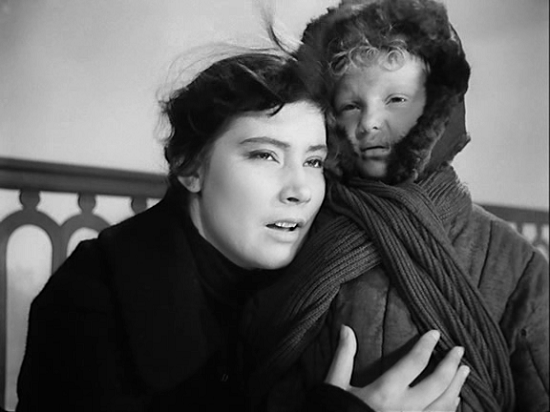 The Cranes Are Flying is one of a handful of groundbreaking Soviet films released to international attention during a brief cultural thaw in the Cold War. 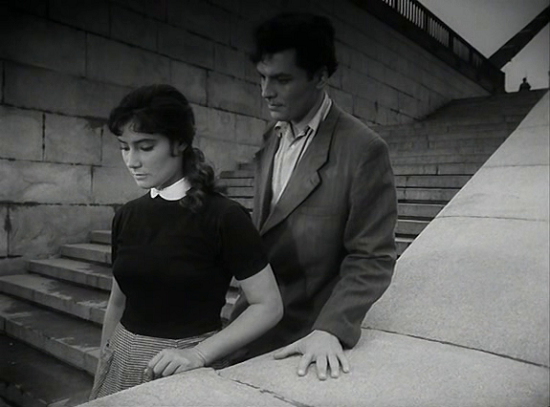 Thanks to a period of liberating de-Stalinization after 1953, films of substance and enduring quality proved that a new Soviet cinema, one not bound to monolithic illustrations of Socialist Realist ideology or Marxist state rhetoric, was taking its place on the world stage. The Cranes Are Flying may be the finest example of this artistic loosening-up going on behind the Iron Curtain. You can almost feel Kalatozov's exhilaration at being free to make a movie again. The story revolves around mainly three characters. In Moscow, a beautiful young woman, Veronica (Tatiana Samoilova), and her fiancé Boris (Alexei Batalov) are very much in love and planning their wedding. But it's June 22, 1941, the day of Germany's surprise invasion of Russia. War is declared and Boris hears a higher calling. He volunteers for duty at the front. Boris' boorish cousin Mark (Alexander Shvorin) is also in love with Veronica; however, this talented concert pianist is a cad who employs deceit to dodge the draft. Once Boris is away, during a night lightning - strobed by furious Nazi shelling, Mark rapes Veronica, or else she gives herself to him in a moment of withdrawal and vulnerability (the moment is open for interpretation). Either way, the result sees Veronica emotionally broken, and she takes Mark as her husband, keeping the reasons for her betrayal of Boris a secret even from her family. The plot takes us through Veronica's various crucibles — her guilt over abandoning the man she truly loves, wartime loss and destruction and displacement, and her work as a nurse in one of Moscow's overcrowded hospitals. While evolving from a passionate, winsome girl to a strong woman shaped by tragedy, she clings to the hope of reuniting with Boris. But we are witnesses to Boris' death at the front, and Veronica (with her country, which loses 20 million lives) must come to terms with reconciling the painful gulf between what we desire and what wartime reality delivers. 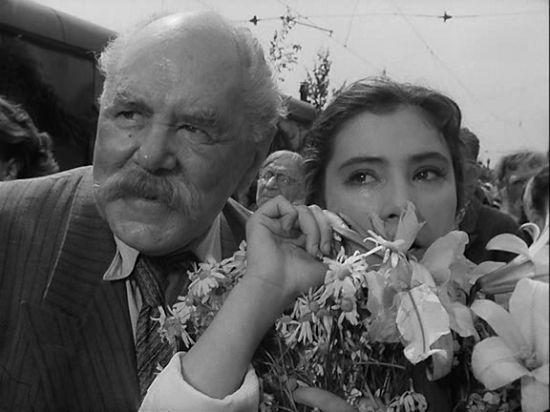 The closing shot — meeting the troop train on Victory Day with flowers for Boris, Veronica acts on a newfound awareness that even after the tragedies of war the living must move forward and onward — will have all but the most hard-hearted misty-eyed. The director Mikhail Kalatozov was the late Stalin's former head of production. A veteran of the early avant-garde period, he cut his teeth in silent films and for a short wartime spell worked in Los Angeles. Influences from both realms are on sumptuous display in The Cranes Are Flying. 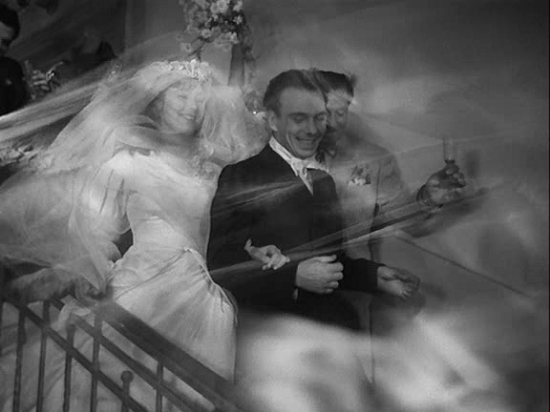 Of special attention here is his collaboration with cinematographer Sergei Urusevsky. 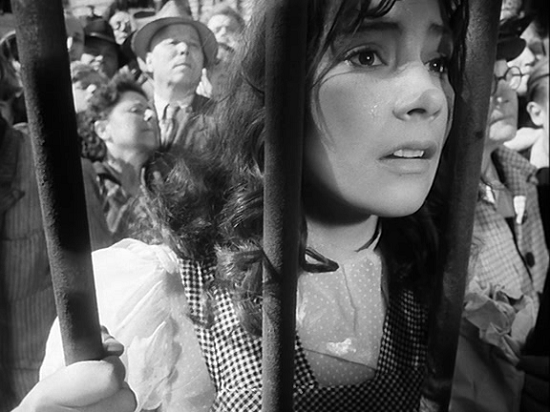 Together they pioneered the use of the "emotional camera," the technique of crafting gymnastic handheld takes to visually communicate characters' emotions. Kalatozov and Urusevsky tell the story with forceful cinematography — expressive compositions, elaborate editing, deep focus, and dynamic use of spacious crane and tracking shots. A scene in a stairwell is a textbook model of imbuing mere architecture with force and feeling. The product of two artful technicians, these lyrical visuals, and some splendid performances, transform a story that might otherwise be thin melodrama into a confident and polished film packing an impressive amount of visual and emotional material into its 95 minutes. 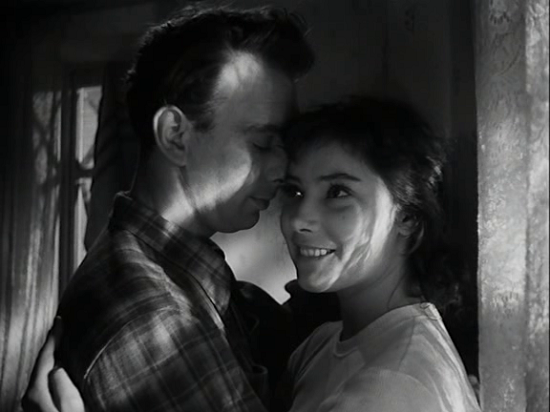 The Cranes are Flying is an absolutely gorgeous movie, with excellent cinematography and direction. It's probably impossible for us here and now to fully appreciate the refreshing newness of this humanist and moving introspection on the personal landscape that literally exploded under the advancing Nazi armies during the Second World War.